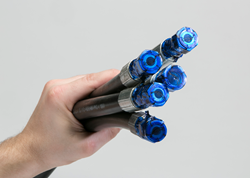 The traditional method used by hose manufacturers to keep hoses clean from contamination is to install injection molded plastic caps or plugs to cover all open hose ends. Despite best efforts, this status quo approach to capping and plugging can still cause contamination — especially if these threaded caps and plugs are snug-fitting and difficult to remove, causing plastic particles to shear off into the hose during removal, or if they are too loose, causing them to dislodge during transit. The heat shrink seal caps provide a secure fit in any capacity and are designed for easy removal precisely at the time of installation. “We are excited to bring heat shrink seal cap technology to our hydraulic hose manufacturing process,” says Dave Stull, Plant Manager for ProPulse. “Unlike the caps and plugs our customers are accustomed to, this technology not only leaves our hose assemblies tightly sealed but it also provides advantages to our customer at the time of installation.” In common practice, assemblers often take off the caps and plugs ahead of time because it takes so long to remove threaded caps or requires the use of pliers to remove the plugs. The seal cap uses a tear strip that can be removed in just seconds. This improves the customer’s speed of assembly and further mitigates the risk of contamination by keeping the hose covered until the exact moment of installation. ProPulse serves hydraulic customers in a broad range of markets including, aerial lift, agriculture, construction machinery, transportation and others. For more information about ProPulse and how they can power your business forward with their hydraulic hose manufacturing capabilities, visit http://www.powermovingforward.com/hydraulics.html or contact the sales team at ProPulse, 8545 Kapp Drive, PO Box 13, Peosta, IA 52068-0013; phone 877-384-4676; fax 800-303-4673; email sales(at)powermovingforward.com. ProPulse® specializes in innovating, engineering and manufacturing unique solutions for users of hose and fittings for high-pressure fluid conveyance. ProPulse® sells worldwide through distributors, retailers, and OEM partnerships and is backed by more than 90 years of experience and innovation. The Schieffer International Group has three operations (Germany, Romania and USA) and specializes in plastic injection molding for automotive applications and value engineered thermoplastic and rubber hose.